How To Update Your Breedables!! Hey everyone I hope that you are enjoying a happy Monday! With the K-9 update coming soon, I wanted to a moment to tell you guys about the importance and benefits of updating! Why update you ask? Well………. *You must update your breedables to take advantage of all fixes in a update. *To breed for crazed or special breedables your breedables must be current version. How to update your breedable? 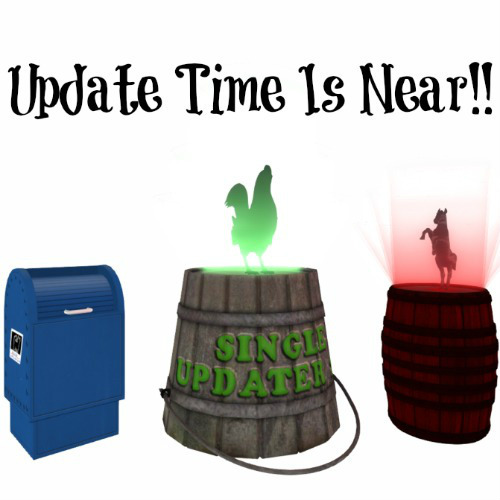 You will have to pick up your FREE updater at any of the Amaretto locations once an update has been released. Place the updater near the animal that isn’t updated and from the animals menu select the update button. The animal will be updated and the settings will be the same as before the update process. Place the bulk updater in the middle of your breeding area, click the updater and adjust the settings you want your animal to be set to after the update process, then select the update button on the updater menu. Do not remove the updater until it has completed updating all animals and the hover text above the updater reads FINISHED. 2. It will not update pregnant animals. The reason being the updater can potentially abort the pregnancy. Waiting to update your pregnant animals will not effect their functions, they will continue to eat, move, animate etc. When they give birth then you can update them. The bundle, kennel, or nest will be the old version and need to be updated when birthed. 4. Sick breedables must be healed before you can update them. 5. You can only update animals that you own. Now you guys should be all ready to update your breedables! Happy Breeding everyone!